Writing a book about roads has made me think about my own asphalt memories. We didn’t have a car when I was growing up (although, bizarrely, I still had a copy of I-Spy on the Motorway) and so on the few occasions I was on motorways – usually on school coach trips to Chester Zoo along the M57 or Blackpool on the newly opened M55 - they seemed rather exotic, especially driving back in the dark when the floodlit blue of the motorway signs and the overhead sodium lamps snaking round in gentle curves seemed like a minimalist version of the Blackpool illuminations. I was born too late for the first flurry of excitement about motorways, but I’m sure I remember an episode of the children’s TV programme, Rainbow, in which Bungle, Zippy and George watch a motorway being built and make up a song out of the sounds of the excavating machines - even if it now sounds like a malarial dream. I also remember Kadoyng, a Children’s Film Foundation feature about a robot who arrives on earth in a spacecraft and befriends an eccentric professor and his three children, helping them to foil the plans for a motorway being built through their village. That must have been one of the first inklings of the anti-roads backlash. My elder brother had a Tom Robinson Band LP with an excitable song on it called ‘2-4-6-8 Motorway,’ although its verses about trucking and hitching had a jarring, American interstate feel. I preferred ‘Driving Away from Home,’ a minor-key road song by an otherwise obscure Liverpool band called It’s Immaterial, which was a hit in the summer I sat my O-levels. ‘Why don’t we cross the city limit and head on down the end of 62?’ it begins, before warmly recommending driving along the M62 motorway for ‘30 miles or more,’ which seems like a long way when you’re 16 and your family doesn’t own a car. The video contained some lyrical images of the shadows cast by the concrete stilts on the M1’s Tinsley viaduct - a decent stab at motorway pastoral, I thought, although perhaps to appreciate it fully you had to be a carless teenager with a slightly skewed take on the quotidian. The film that made motorways improbably romantic for me is Withnail and I, set in 1969, which I first saw in Manchester’s Cornerhouse cinema when I was in sixth form. The eponymous characters have decided to escape from the squalor of squatting hippydom for a weekend break in a cottage in Penrith. While a wrecking ball is being put to London, I (Paul McGann) flicks his sunglasses down in a sort of symbolic exit from the town as he drives them up from Camden to Staples Corner. A drunken Withnail (Richard E. Grant) is reading from a news story about fatal car accidents, and cries that these are not accidents, that the pedestrians are flinging themselves into the road ‘to escape all this hideousness’. Then suddenly we are on the M1 at dusk, and they have caught the near-desertedness of the early-era motorways beautifully. They must have cleared the motorway to film it (although, oddly, only on one side, since the cars coming in the opposite direction seem to be of mid-1980s vintage). The entire scene is done to a backdrop of Jimi Hendrix’s ‘All Along the Watchtower,’ its clanging guitars and apocalyptic lyrics a perfect accompaniment to this rock’n’roll motorway. Any film that can re-enchant the M1 like that has to be worth a look. 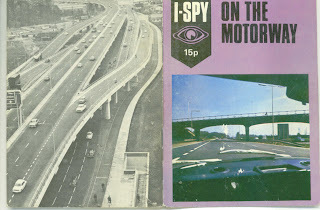 firstly, i love the 'I-Spy' books which were only surpassed in interest, during my youth, by the Ladybird History, Science series, although admittedly, 'I-Spy' were a very different animal. As someone who has an interest in travel and travel writing, i think motorways have had a bad deal and i think they have quite a poetic appeal to them, especially at night when you see their illuminated lines undulate and vanish into the geography. As a keen driver (please dont get at me about my carbon footprint - i feel guilty enough as it is), motorways allow me to listen to Radio 4 in a mode that would suggest that i am part of a more concrete, as well as wider network. Did you see the excellent BBC4 TV documentary on Motorway Service stations? A great idea.